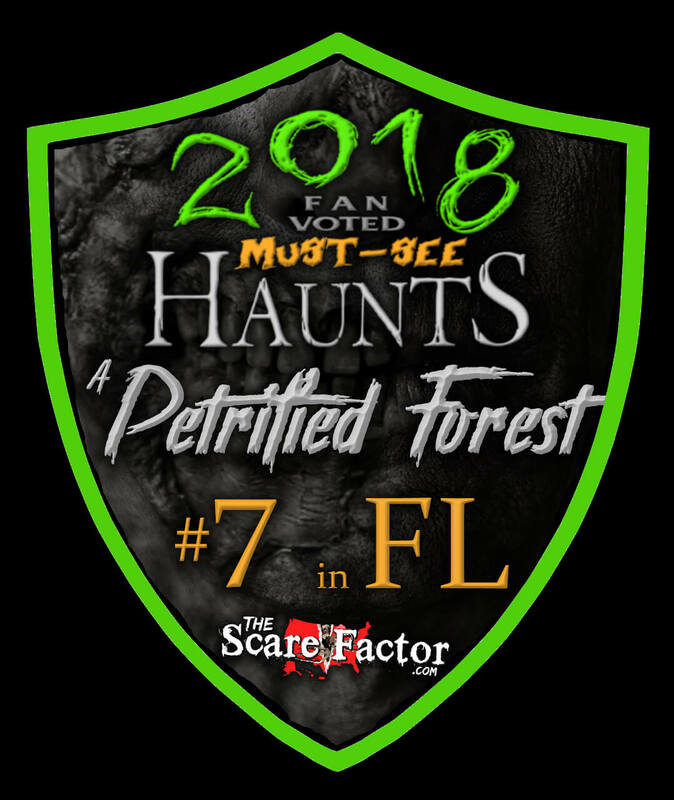 Team Giraffic Shark reviewed this Haunted Attraction on October 19, 2018. A PETRIFIED FOREST returns for 2018 with two new trails, THE HUNTED and THE FAMILY’S SWAMP. This attraction takes place on an empty lot and is built from scratch within a short amount of time leading up to the season. 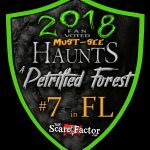 A PETRIFIED FOREST builds two original haunts every year featuring unique themes, characters, and layouts. The trails always promise to be dark, twisted, and filled with scares around every corner. Located close to the Orlando theme parks, A PETRIFIED FOREST offers a nice alternative for those not interested in the crowds and expense that comes with large theme park attractions. A PETRIFIED FOREST employs a large number of performers to work in their haunted trails. The cast in THE SWAMP had strong story-based performances, even looping in the performers within the general scare grounds into their story. Sissy, one of the atmosphere performers, has a story for how she relates to all of the other atmosphere performers, and even gives you tips and things to look out for upon entering THE SWAMP. The priest character continued his scene and dialogue despite losing power for a few minutes to the entire trail, and assisted in guiding Guests through his scene in the dark while not losing character. Performers in THE HUNTED seemed to lack overall direction and character descriptions, as performances often were confusing, with unclear dialogue and scares not driven by a consistent story between all performers, resulting in minimal scares and a confusing experience overall. Costuming at A PETRIFIED FOREST is rather simple for the most part, consisting of distressed street clothes, plus various specialty accessories, and some specialty costumes and pieces. Masks in THE SWAMP are extremely successful, with a naturalistic swamp-like texture and animalistic aggression to them, especially when matched with strong performers. Makeup is simple and effective in creating unique characters. Atmosphere characters were more detailed than the performers in the trails, due to light levels and the length of time they will be interacting with Guests. A PETRIFIED FOREST’s simple, yet effective approach to Costuming helps to bring a wide variety of characters to life on the trails. Employees are dedicated to providing great Guest service, especially including the friendly ticket booth and front of house personnel. Though not all of the employees are as engaging and friendly, the team gets the job done and manages their operation. Our host for the backstage tour was friendly, energetic, and engaging, providing a fun experience for all guests, of varying haunt knowledge and experience. The attraction is easy to locate via GPS, including the free offsite parking lot and the Terror Trolley (optional transportation to the front of the haunt). Though it is to be expected with trails in the woods, there are obviously moments of uneven footing. However, at A PETRIFIED FOREST, it seems like there are a good amount of tree roots and long grass/small brush, so it is advised to wear good shoes, and certainly no open toed shoes on these trails. There are also some areas where it is unclear where the path goes next, and with a wrong turn, Guests can quickly end up in the middle of a pile of brush or behind a set piece. A PETRIFIED FOREST installs a fence surrounding their attraction, blocking them off from the busy main road and creating their own, more private location and home for their attractions. Once inside the fenced perimeter, scary characters roam and music fills the air, creating an atmosphere very different from the other side of the fence. When we visited, a DJ was playing club-type music, whereas in previous years, live bands had been featured onstage. We personally would much rather enjoy the live music, which gave a very original vibe vs the canned DJ music, but we are unsure if live music is still featured on certain nights. A PETRIFIED FOREST is very much an “old-school” haunt, with very few advanced special effects, one of which being the ever so popular “laser swamp” effect, aptly placed in THE SWAMP attraction. Creative and original scenic design is certainly present here, including the wasp hallway, bridges through the woods, shipping crate stunts, and the interstate disaster scene, among others. Unfortunately, lighting is very generic in most places, featuring color washes or dark scenes, which do no favors to the details of the scenes, either washing them out, or keeping them too dark to see, also making it hard for actors to effectively scare Guests. Some more refined and defined lighting through pin lighting would go a long way in creating focus points and distractions through scenic elements, adding to the scare potential. A PETRIFIED FOREST created some impressive bridges through the trees in THE SWAMP, however, they were only lightly used for scares, missing out on some great potential as Guests traverse the narrow, twisted bridges. The facades of both attractions are very impressive and detailed, creating very distinguished landmarks and photo opportunities for each attraction. THE HUNTED features a new technology to the attraction, “Z TAG”, a small beacon on a necklace displaying “health status” indicated by a blinking light. Characters are to touch the beacon and affect the health status until the Guests are to locate a doctor, allowing the status to be restored. Unfortunately, while this an interesting technology, falls a bit flat and cumbersome at A PETRIFIED FOREST. The directions were unclear and the attraction didn’t have enough Z TAG necklaces for the all the Guests within the haunt at a given time, so they began sending one per group (also indicating desire to be touched by actors), limiting the interactivity, which the haunt relies on heavily for its theming and overall experience. An interactive attraction could have perhaps been more effective with a simpler (and cheaper) setup in order for the attraction to stay focused on the story and the scares. A PETRIFIED FOREST brings two new and original themed haunts to life each year, creating new experiences and content for each subsequent year. This year features the post apocalyptic THE HUNTED, and THE FAMILY’S SWAMP. Both attractions are heavily themed, though there are some incongruous sections that don’t seem to fit among the rest of the attraction (shipping container “fire” scene among a swamp theme), and the theme in THE HUNTED becoming cluttered due to a lack of story-based dialogue and character intent. Despite the specific storyline, however, the post apocalyptic world comes to life quite successfully in this attraction. A PETRIFIED FOREST packs in many good scares which are most effective when hidden in dark corners of the woods. THE SWAMP was very focused on providing great scares in and among the effects and heavily textured trails. THE HUNTED, as mentioned above, gets bogged down by a cumbersome technology, and unfortunately does not provide very many scares. The scares that did hit, however, were effective and strong. SISSY, an atmosphere performer, delivers many strong scares through her impressive skills with a chainsaw and her creepy baby doll. A PETRIFIED FOREST offers single scare trail tickets at $15.00 online or double scare trail combo tickets for $25, providing options for every budget. VIP tickets are $33 online plus fees. It took our group about 18 minutes to tour both trails. They also feature a variety of offerings within the scare grounds, including a pet adoption agency, gift shop, concessions, characters, and live music/DJ. The ticket price is fair for those looking for a full night of entertainment and plan on enjoying the atmosphere beyond just the haunted attractions. A PETRIFIED FOREST also offers a backstage tour, giving a behind the scenes glimpse at the trails, including information on construction, design, performers, and even the opportunity to scare some unsuspecting Guests.